After her fatal choice... extraordinary hope. It could all be over soon, and then I won't hurt anymore. Kristen Anderson thought she had the picture perfect life until strokes of gray dimmed her outlook on life. Once a happy child, Kristen's world darkened after three friends and her grandmother died within two years. Still reeling from these losses, she was raped by a friend she thought she could trust. She soon spiraled into a depression that didn't seem to have a bottom. One January night, the seventeen-year-old made a decision: She no longer wanted to deal with the emotional pain that smothered her. She lay down on a set of cold railroad tracks and waited-for a freight train to send her to heaven...and peace. It's going to be over now. The pain is going to end. I'll be in heaven soon. Amazingly, Kristen survived her suicide attempt... but the 33 freight cars that ran over her severed her legs. Now she not only had to deal with depression; she also had to face the physical pain and life without legs. But Kristen's story didn't end there. After her darkest days Kristen discovered a real purpose for living. 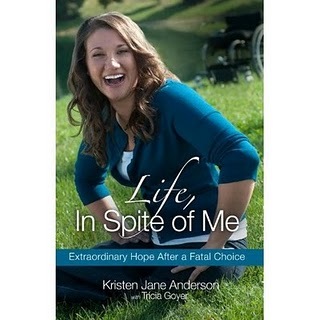 Now, in her compelling book Life, In Spite of Me, Kristen shares her journey from despair to hope. NOT FROM HERE, USE TWITTER OR TRICIA GOYER's BLOG! For a chance to win a 5 book Tricia Goyer library – any five books of your choice! Being a subject of such sensitive nature I was nervous to read this book. Suicide is one thing in the world that we all wish we saw less of. Kristen's story, right from the very beginning, caught me and pulled me tight to it. I couldn't put the book down. I knew she survived, but while reading, you forget that and just want to see her through. Your heart breaks at times, but in a way that makes you appreciate what you have. I really didn't think a story, though real, could resonate through me like it does. This is one of those books, you tell all your friends about. Definitely on my recommendation list! Beautiful review. I've been considering this one.